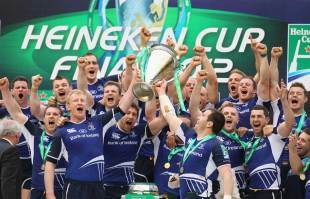 Features: How can Ireland capitalise on Leinster's success? Leinster secured their third Heineken Cup with a ruthless 42-14 win over Ulster at Twickenham on Saturday and cemented their status as the true giants of the tournament. Man of the Match: It could be any number of Leinster players with Brian O'Driscoll excelling at outside centre and Rob Kearney imperious at fullback. Jonny Sexton kept the scoreboard ticking over with aplomb but the key man was Sean O'Brien. He was simply superb. Key Moment: The penalty try at the start of the second-half effectively killed off any chance of an Ulster fightback. It made the score 21-6 to Leinster and despite Ulster threatening to mount a comeback, Leinster just went into yet another gear. Hero of the game: Brian O'Driscoll had keyhole surgery last week and played nearly a full Heineken Cup final days later. An unbelievable effort. Villain of the game: It's harsh on the youngster but Paddy Jackson struggled on the Twickenham turf. He's going to have a huge future in the game, but on this occasion, it was just too big a stage for the 20-year-old. Stefan Terblanche runs him close, however, with his late yellow card illustrating his frustration. Talking Point: Nigel Owens' question for the first try of the game - 'Is there any reason why I can't award the try?' - weighted the balance firmly in the attacking side's favour. This was perhaps the wrong call, but it should not detract from Leinster's performance. Instead the abiding memory of the match will be the Leinster team's hands. The speed at which they move the ball is simply frightening. Play of the game: The movement for Cian Healy's try was unstoppable. Leinster turned over the Ulster scrum with O'Driscoll unleashed. His sensational offload put away O'Brien and with Eoin Reddan sniping at the foot of the ruck, quick-ball was obtained and Healy went over. From Ulster scrum to Leinster try in the blink of an eye - ruthless. First-half tries by flanker Sean O'Brien and prop Cian Healy put Leinster on the way towards a record-breaking triumph. And with midfield magician Brian O'Driscoll calling the shots, Leinster's reign as Heineken Cup holders was never seriously threatened in front of almost 82,000 spectators at Twickenham. A penalty try early in the second period confirmed Leinster's dominance - it was awarded after Ulster collapsed a driving maul - and there was no way back for the underdogs after that. Fly-half Jonathan Sexton kicked three conversions and three penalties for a 15-point haul as Leinster became the first team since Leicester in 2002 to successfully defend the Heineken Cup. And when replacement prop Heinke van der Merwe and Sean Cronin scored near full time - Cronin's try being converted by Fergus McFadden - it gave Leinster the biggest winning margin in Heineken Cup finals since the tournament began 17 years ago. They also added the most tries in a Heineken final for good measure, and the most points scored. Ulster could only admire such quality as Leinster laid claim too be the greatest team in European club rugby history. Ulster threatened in patches, yet their only consolation was a late Dan Tuohy try that followed three Ruan Pienaar penalties. Once again, Leinster delivered when pressure was its most intense, following up victories over Leicester at Murrayfield three years ago and Northampton in Cardiff last season. Ulster had their moments, but they came too far apart to trouble a Leinster side that will now go for a trophy double in Dublin tomorrow week. Victory over the Ospreys would see Leinster crowned RaboDirect PRO12 champions, which would confirm beyond doubt their status as European rugby's premier force. Key Leinster players O'Driscoll and Rob Kearney were both declared fit for Leinster's title challenge. O'Driscoll underwent minor knee surgery nine days ago, while Kearney showed no ill-effects from a back problem he suffered during training yesterday. Ulster were bolstered by their All Blacks prop John Afoa's return after serving a four-week ban, with lock Johann Muller leading a team whose European scalps this season included Munster, Leicester and Clermont Auvergne. And it was Ulster who made the early running, notably through centre Darren Cave, as Leinster found themselves stretched defensively. Welsh referee Nigel Owens appeared keen to encourage an open game, and Leinster capitalised through a sustained passage of play that resulted in O'Brien crashing over. Owens required confirmation from television match official Jim Yuille before awarding the try, and Sexton's conversion hoisted Leinster ahead, but he missed a 45-metre penalty chance just two minutes later. Both sides looked to move possession wide, yet errors inevitably abounded given the game's high stakes, and Leinster were content to maintain their advantage as the final lost much of its impressive early momentum. The defending champions, though, dug deep into their box of tricks eight minutes before half-time - and Ulster were punished. O'Driscoll made initial inroads, then delivered a stunning offload to O'Brien, whose pace left Ulster's defence at sixes and sevens, creating enough space for Healy to score. Sexton again added the extras, and Ulster found themselves in all kinds of strife as half-time approached. And their misery was compounded when fly-half Paddy Jackson sent an easy drop-goal attempt wide, meaning Leinster could close out the opening 40 minutes in control despite Pienaar booting a late long-range strike. Leinster looked to underline their dominance within minutes of the restart, and that wish was granted when Ulster illegally halted a Leinster maul and Owens awarded a penalty try that Sexton improved. The Ireland international then added a penalty, and Ulster had no choice but to go for broke. That approach was rewarded when centre Paddy Wallace made a decisive break, which created room for Tuohy, who powered across from close range. But Leinster sealed the deal with two further Sexton penalties during the final 13 minutes, before Van der Merwe ploughed over to seal a tournament record that was enhanced by Cronin's last-gasp effort.